With The Jersey Project, Bill Humphreys and Jerry Dunn have created a North American version of the Dutch book Koerstrui (by John van Ierland and Evert de Rooij), a book documenting more than 1,000 historic, iconic, and bizarre cycling jerseys. Visually stunning, you can spend hours leafing through jerseys from all over the world, with several pages added to the original Dutch collection by Humphreys and Dunn commemorating the North American scene. 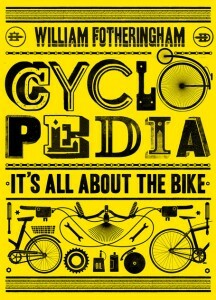 William Fotheringham’s Cyclopedia: It’s Not About the Bike is the perfect gift for trivia fans who find themselves looking for something they can dip and out of at their leisure. Arranged alphabetically, the book is stocked with 430 pages of facts, stories, diagrams, and other interesting ephemera. You can get it for your Kindle too. You can grab both titles from the good folks at Gage & DeSoto. And while you are there, check-out their stylish line of t-shirts, caps, and various other cool-kid accessories. Pros: Both books are well-researched, entertaining, and affordable. Peeves: It’s a minor peeve, but Cyclopedia could use some color photos and graphics. This entry was posted in Equipment, Featured, Musette and tagged Books, Cyclopedia, gage and desoto, holiday gift guide, The Jersey Project. Bookmark the permalink.